The big reveal for the third Use the Muse contest is happening tomorrow and Scarlett Lanson over at The Beader's Muse is doing a number of giveaways in preparation. I'm going to take the next couple of posts to answer them starting with what my favorite part in taking part in Use the Muse is. For me, Use the Muse is first and foremost an opportunity to experiment with new things. Therefore one of the est things about the contest is the excitement I get when I see the box with the new kit and muse in the mail. 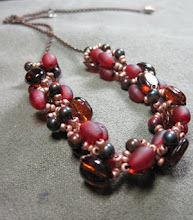 It's a chance to work with beads, colors, and materials I might otherwise have ignored in the bead store. The challenge of creating something with new materials helps push me into new styles and techniques. In both the Use the Muse contests I have participated in the focal pieces has been something I never would have considered using. This has allowed me to expand on the types of pieces and styles I create and that is my favorite part of this type of contest.